Yesterday we had about five inches of new snow in the morning. The accumulation of snow made the skiing interesting along the edges of the trails. Some trail edges remained untracked and provided an opportunity to enjoy the performance of rockered fat skis. Even in the heavily travelled sections of the slope the fat skis performed well by busting through the soft moguls. I have noticed that many geezers avoid these conditions or at least find the deeper snow to be more exhausting. In the East we usually are faced with firm to icy surfaces so the ski of choice is usually narrower. Yesterday was the exception. There is almost no greater pleasure than gliding through several inches of fresh snow. 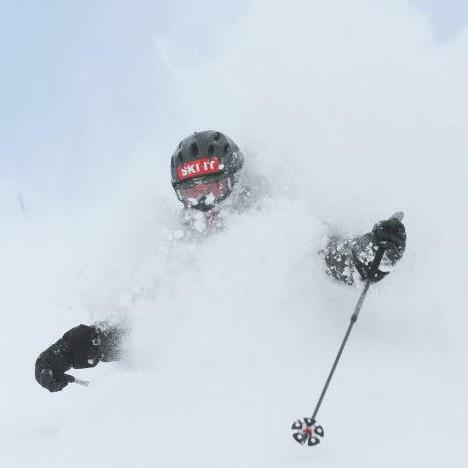 Of course the conditions we had yesterday pale in comparison to the foot or more of powder of the slopes in Utah. (Note that I have been viewing the "face shots" on Facebook of my son and grandson skiing at Snowbird in Utah). They are skiing on really fat skis! With the snowfall today and more anticipated tonight, I am looking forward to another fat ski day tomorrow. Even though I would have liked to be out there today, I recognized that that my legs need a recharge by a day off the slopes. I like to think I am still am "Tough Old Geezer Skier" but even with that toughness, I still have enough of a brain to take time to recharge the batteries. To all a Happy New Year and may 2013 bring us many fat ski days.